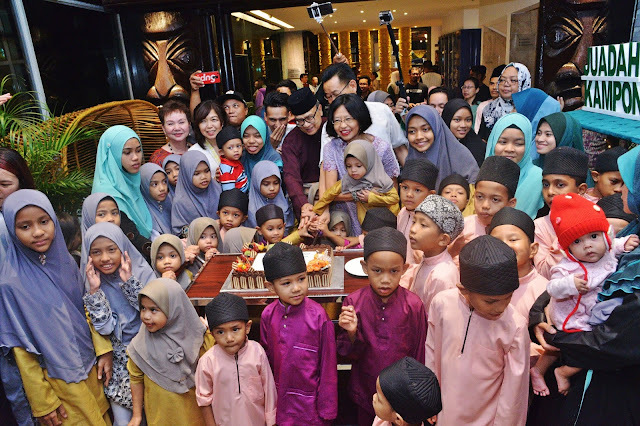 The sound of excited anticipation resonated around the Kontiki Restaurant at Federal Hotel recently when children from Rumah Nur Kasih Bestari were invited for a Buka Puasa treat. The annual event is part of the hotel’s Sharing & Caring Community Commitments. At what was probably their first buffet experience, the younger children from the home could barely contain their excitement and didn’t want to miss out on anything. Some were so tiny they stood barely at table level and the amused hotel staff, including Ooi Lee Ping (director of Group Marketing, Sales & Business Development) and May Lee (senior manager of Marketing Communications & Business Development), volunteered to pick up the young ‘uns so they could see the buffet spread. Naturally, the loudest oohs and aahs were heard at the colourful dessert table where pretty cakes and pastries sat next to freshly cut fruit, pudding and local kuih muih. Indeed, the tables were practically groaning under the variety of food laid out. Out on the terrace next to the pool was the barbecue/deepfried section. Nearby, a row of potted plants had been emptied to accommodate more food stations, iced drinks and dessert such as cendol, ice kacang and ice cream. Stalls had been set up for nasi bukhari, shawarma, roasted chicken, lok-lok, roti canai, murtabak, dim sum, rojak sotong kankung, and Gearbox soup. The island barbecue pit accommodated a whole lamb on the pit, beef tenderloin, satay, otak-otak, chicken wings & drumsticks and juicy flavoursome quail as well as grilled seafood such as various types of prawn, crab, mussel, squid, stingray and kembung. Inside the restaurant, it’d be best to start with the appetisers in the centre, soup (2 types daily; there are 8 rotating menus) or bubur lambuk. Take your pick of favourite ingredients for gado-gado, rojak buah, acar, salted fish and salted egg, all kinds of kerabu and ulam-ulam offered with a choice of 6 kampung-style dressing. There are also cold cuts, salads, sushi/sashimi, lemang and pulut kuning with serunding as well as tahu sumbat. The main dishes are kept hot in rows along two sides of the restaurant. These include dishes from Tunku’s Cuisine (favourites of our first Prime Minister, Tunku Abdul Rahman Putra Al-Haj). At one end are the Hainanese chicken rice and noodle station; on that day, it was prawn mee soaked in a scrumptious crustacean gravy and topped with fried shallots, prawn, egg and sambal. We helped ourselves from chafing trays filled with Tunku’s Cuisine such as Ikan Goreng Serai, Sambal Udang Petai and Daging Kicap with peas. These dishes are indicated with a picture of Tunku’s Cuisine book. From the hotel chefs, we tasted Hati Ayam Kicap, Paru Goreng Berempah, Ayam Paprik, Mussel Masak Asam Pedas, Mutton Dalca and a really delicious Pucuk Manis Lemak Keledek. All these go best with plain white rice. Then there are noodles such as Fried Yee Mee and other Chinese dishes including Four Treasure Soup, Braised Beancurd with Seafood, Assorted Mushrooms with Vegetables, Fried Squid with Dried Chili and Yong Tofu. Like Western dishes? Try the yummy Roasted Duck with Orange Sauce, Spaghetti Bolognaise and Grilled Lamb Cutlet on Ratatouille paired with New Potato with Chopped Parsley.